1. Walk around with only 2-3 lenses max, and keep them concealed in a small shoulder bag kept in sight at all times. You don’t need your 70-200mm f2.8 unless you are in Vietnam on an assignment. I travel with a 20mm, 50mm and an 85mm and that’s discreet and enough. 2. Hold your camera close to your body when walking and maneuvering the city. Avoid holding your camera out, especially when shooting at the edge of the road, a biker can easily speed up and swipe it out of your hand. 3. When you spot a good subject, do not quickly walk up to the person and hurriedly start snapping photos. Because you do not share the same language does not make you invisible to them, they will notice you and wave at you to not take their photo if you are too agressive. Be smart and be polite, see #5. 4. Thieves are not magicians, you do not need to be in a state of constant alarm as you travel the city. Turning your head for five seconds or blinking will not result in stolen gear. Relax and enjoy the journey as much as you enjoy your shooting. Simply do not let go of your gear at any time while you are outside your hotel, when you’re not using it, put it away into your bag and keep your bag over your shoulder. 5. Be polite, try asking permission before shooting someone if you want to get super close or get a portrait. Many people understand and speak English in Vietnam. When shooting street and wanting to evade detection, employ my street shooting techniques which I mention in an earlier post here. Common sense! That’s all it really takes. These five points above are the same that you would follow anywhere else in the world. When I read the travel forums, the most common topic re:travel is always “What lens should I bring?”. Avoid traveling with physically large lenses, unless you’re on safari. Traveling to any major world city, a 20mm, 35mm, 50mm, or 85mm will suffice. It’s more about physical size and being discreet. When you’re sitting outside at a street cafe, unless you’re in your early 20’s and very fit, you really don’t want to be sitting with a giant 70-200mm on a D3 while motorists zoom by planning to snag the equivalent of a years worth of their salary off your lap. Nobody touches my D700 and 50mm strapped to my wrist, held close, while I carelessly walk through a crowded night market. Last thought here, but regardless of where in the world you are, if your subject looks dangerous and you think it would make a great shot(tattoo men sitting around a girl in mini skirt and red high heels, DON’T take the shot unless you have nailed the technique I mention in #5. Not sharing a common language also means you will not be able to excuse yourself out of a troubling situation should you cause one. 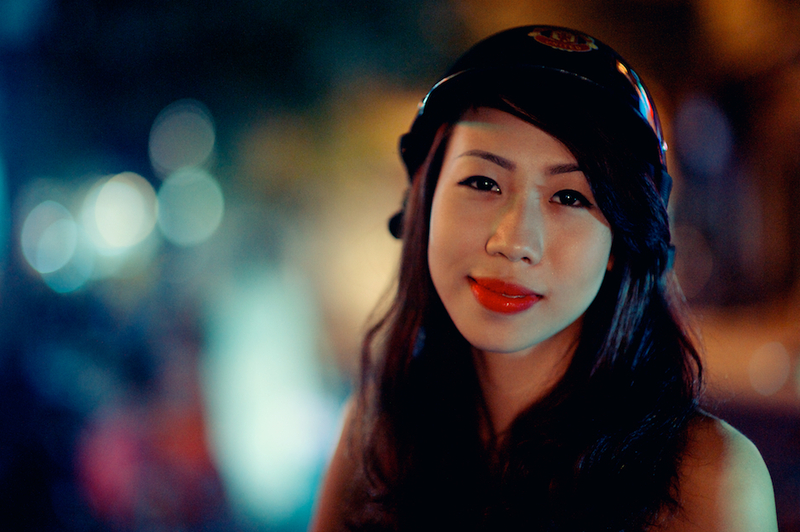 Hanoi was a dream for me as a street photographer. Wonderful subjects, something unique and interesting every 10 seconds, great food, friendly people. Beautiful place.